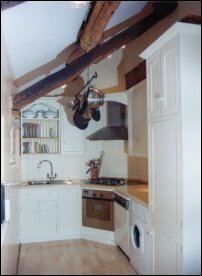 Traditional designs combined with customary materials make very stylish and characteristic kitchens. Dramatic country designs made with Oak, Pine or hand painted can be complimented with wooden work tops such as beech or Iroko. A choice of wooden, ceramic or steel handles will add the finishing touch to any traditional kitchen. 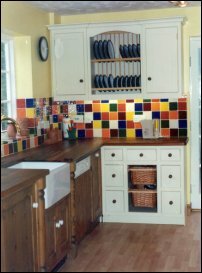 This stained pine kitchen with Iroko work tops has been brought to life with these colourful ceramic tiles. This tiny cream painted kitchen fits snugly into the corner of this character cottage.